On Thursday, November 1st 2007, Posy Simmonds launched her latest graphic novel Tamara Drewe, published by Jonathan Cape, with a live demonstration of her drawing and a conversation with writer Lisa Appignanesi, part of the 2007 Comica Festival. 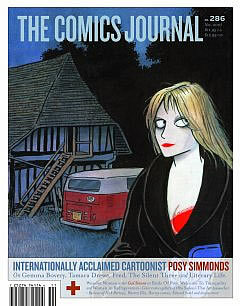 Coinciding with this, the latest issue of The Comics Journal cover-features a lengthy interview by me with Posy. Here is my introduction and an extract. Posy Simmonds is simply one the world’s most sophisticated contemporary cartoonists expanding the scope and subtlety of the graphic novel. She lives with her partner, graphic designer Richard Hollis, in a detached, discreet town house in a quiet square not too far from King’s Cross railway station in London. Negotiating time for this interview means juggling with her deadlines to deliver the last revised pages of her latest graphic novel, Tamara Drewe, and with her imminent departure on her August birthday holiday in France. Posy also has to squeeze in an urgent appointment with her regular hairdresser, who, she confides, used to trim the locks of Anthony Blunt (he was the esteemed art historian eventually exposed as a Soviet spy). 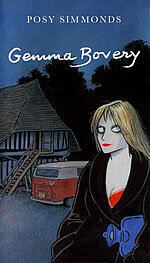 Until the belated publication in 2005 by Pantheon of her 1999 graphic novel Gemma Bovery, Posy Simmonds was a bit of a secret to most American readers, aside from a smattering of Anglophile devotees. 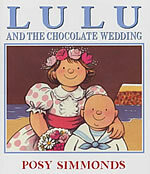 Prior to this, precious little of her work had ‘crossed the pond’ and much of what did dropped off the radar of many adult graphic novel aficionados: a selection of her colour children’s books, including Fred, made into an Oscar-nominated animated film; a brief and, in her view, flawed foray into monthly strips on American topics for Harper’s Magazine; a contribution to Strange Stories for Strange Kids, the second of Art Spiegelman and Francoise Mouly’s Little Lit compendia, not reprinted in last year’s Big Fat Little Lit paperback. 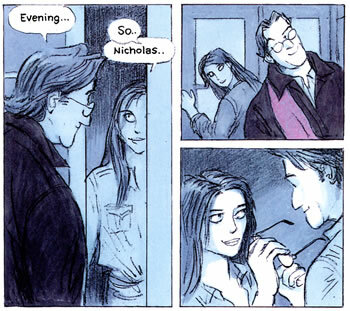 So for many, her graphic novel Gemma Bovery came as a revelation, a sharply observed, satirical update of Flaubert’s notorious adulteress Madame Bovary. Gemma is the discontented second wife of Charlie Bovery and stepmother to his kids. 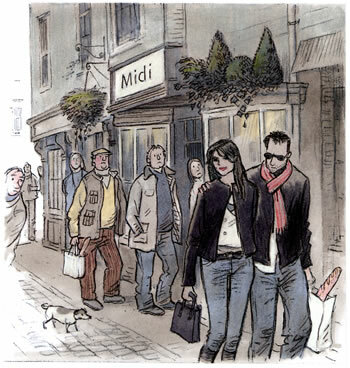 Weary of her London existence, she persuades Charlie to retreat to rural France. When her fantasy idyl fails to live up to her expectations, she is drawn, like her literary namesake, towards ennui, debt and adultery. And this leads to her death, as we know from the book’s opening sentence: "Gemma Bovery has been in the ground three weeks." Gemma’s story seems to parallel Flaubert’s Emma, but it’s not for nothing that her name is slightly different, and so, we learn, is her fate. Narrated in flashback by local baker and book-lover Raymond Joubert, the daily unravelling mystery gripped readers of The Guardian and boosted the newspaper’s circulation, proof that serial strips can hook the public and build loyalty. In book form, Gemma garnered rave reviews, hailed by Michiko Kakutani in The New York Times for the way Posy’s drawings "completely embody the tone of this book: bemused affection for her characters combined with delicately barbed sarcasm and fresh, cheeky wit." Through translations into French, bish, Italian and more languages, Gemma has finally introduced Posy to the international audience she deserves. To explain its plethora of cultural references, this interview threatened to become the most footnoted in the Journal’s history. 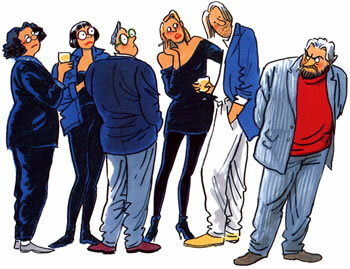 Undeniably, Posy Simmonds and her work are quintessentially English. To understand them both and appreciate how her sophisticated skills at crafting comics have uniquely evolved, it’s important to understand her childhood and early years and the formative influences on her, both verbal and visual. 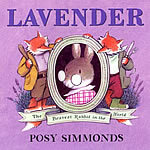 For little Rosemary Elizabeth Simmonds, born in 1945, books, comics, magazines filled her life and inspired her to make her own, treasures she still owns. Studying at the Sorbonne in Paris and Central School of Art and Design in London broadened her knowledge and experience. Her long career in the British press, from her Weber family saga to her Literary Life skits, have won her millions of admirers. Her career, indeed her whole life, also seem to have perfectly prepared her now for the multiple demands of creating and maturing the graphic novel. This November brings the publication in Britain from Jonathan Cape of Tamara Drewe. Like Gemma, this was serialized in The Guardian, starting in 2005, but on a weekly basis in their Saturday Review section, often in double episodes. 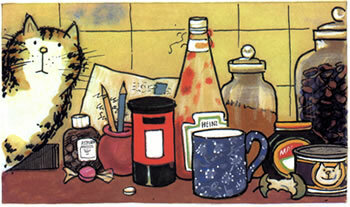 It sees her applying her skills with colour, polished first on her successful children’s books, to adult comics at last. This time, her literary allusions are to Thomas Hardy’s 1874 novel Far From The Madding Crowd but transposed to modern, celebrity-obsessed Britain and the tensions between city and country. When ambitious urbanite Tamara inherits a family home deep in the English countryside, she turns the heads of three rival males and soon the whole village is abuzz with secrets and desires. 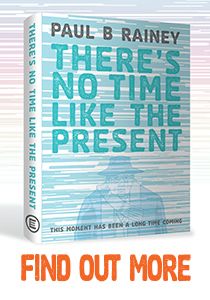 It will be one of the graphic novels of the year, without a doubt. 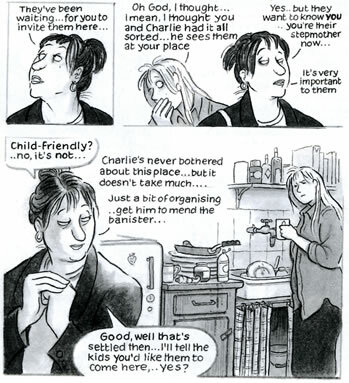 Posy has come to occupy a special role in Britain as a popular and respected woman cartoonist, one of the few, her work exhibited and commissioned widely and winning her the Cartoonist of the Year award twice. 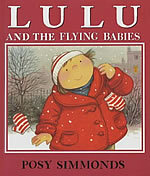 She received the honour in 2002 of an MBE (Member of the British Empire) for ‘her services to the newspaper industry’, while in 2005 both Posy and Raymond Briggs were admitted into the worthy, and traditionally wordy, ranks of the Royal Society of Literature. 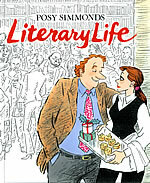 In fact, Briggs, Posy’s good friend and fellow author at Cape, was only half joking when he wrote about Jimmy Corrigan garnering Chris Ware the prestigious Guardian First Novel Award, and speculated, "Does it mean that we will live to see an ancient Dame Posy Simmonds go tottering by." This may yet come to pass. For a long time, this seemingly innocent poem and game (players sneeze and then fall to the ground) was thought to refer to the 1660’s Plague of London, the ‘posies’ being herbs which people carried in their pockets in the hope of warding off infection. That juxtaposition of childhood and the sweet and beautiful with the macabre and death, humour and tragedy, strangely suits the full range of tones and themes in her oeuvre. In 1984 Posy was asked by Russell Willis in his magazine Infinity (No. 7, November-December) whether she’d like to a ‘serious’ strip book. She replied, "There’s a comment I used to dread at art school, or at school even: ‘When are you going to do something serious’ and I used to think, ‘Um… like what’ Write a book about the drainage patterns of the Nile… or the evolution of bee-language? When will I do something serious? I don’t know - perhaps when I’m a big girl." Posy’s recent achievements prove that while she is now perhaps being more ‘serious’, she will never lose her mischievous wit and subtle satire. So I wondered what happened when you left boarding school. When did you get to college or art school? The Sorbonne I know is somewhere in here, as well. Yes. Well I went straight from school to Paris. You must have been good at French then. Yes. I couldn’t speak it, but I could write it. So you got to A-levels? I did A-level art. It was rather odd. It wouldn’t have been allowed now. I did A-level art in a year, because I knew I wanted to go to art school. Wanted to do it in one year rather than two? And I just did one year of English A-level and French A-level and then didn’t take it. So I left school at 16, because my birthday’s late. My birthday’s in August. So I’d then just turned 17 and went to Paris. And I’d never been abroad before. So it was a huge leap. At the time you often did a year before you did anything - being kind of finished off. So it wasn’t exactly finishing school. It was being sent to a family and then learning French. And there was a course at the Sorbonne, which was for foreigners, and because my French was already quite good I could go there. I mean there were Americans there who didn’t know how to speak French at all, so they would be in the very basic grade. And then it sort of went upwards according to your ability and it taught you all about French civilization and literature. There was no question of visits from your parents there? No. It was lucky I’d been to boarding school, because I knew what it was like being on my own. And were there students from all over the place? Yes, every nationality was there. Which is again stimulating if you can make contact with all kinds of people, probably cultures that you weren’t so familiar with? Yes. I think it was wonderful that you also met people from a different class, because in a way I had a very sheltered upbringing, going to boarding school. I’d never really met people from a different class or different nationalities. Because it was based on abilities, not based on fees or anything like that - were you on a scholarship then? No, you had to pay fees. But I don’t think they were particularly huge. So what was the family like that you were living with? So extraordinary… I mean I think my parents would have been horrified. Did they meet the people you stayed with first, then? No. It was done through an agency called Gabbitas-Thring which was a sort of scholastic thing. Oh, is that a real name?! Do you remember that? It occurs later in Molesworth. I know, where Searle draws them as two sinister teachers who “trap a young man and lead him off to be a master”! Gabbitas-Thring found families for young people to go and stay with. So the family, how did you get matched with them? I think Gabbitas-Thring sent my parents various families and they happened to choose this one who didn’t even live in Paris, it was actually in the banlieues [suburbs], so I had to get a train into Paris. Later on, when I’d done it for a couple of months, I wrote to my parents and said, “This is awful. I have to (a) get up so early to get into class and (b) take the late night trains which were full of what we call “lechers.” And that was quite frightening. What year are we talking about when you went over there? I went in September, ‘61. So I would have been just 17. What was the family like? Did they have some children around your age that you could get on with? No. There was one daughter who was about 30, who seemed to me kind of ancient. So these parents were what, in their 60s? Yes, but they were quite elegant. Yes. There was a grandmother that lived in the house. I don’t know - she won’t hear about it - but my first night there, it was the end September. And I went up with my little transistor radio and I was in the room at the top of the house, and I was feeling a bit homesick. I’d never flown before so I’d had two experiences. My mother had come with me and met “Madame” when I was handed over. And we noticed as we came in the front door that a black shadow darted across a passage and then disappeared. 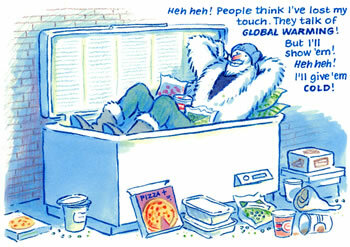 And later on, it was grandmother who was hiding behind the fridge. [Laughter.] All dressed in black. It was. There I was in the bedroom. I was told to lock my door when I’m in my bedroom. So I was there and hadn’t put the light on, but I’d got The Archers on my radio, feeling homesick and wanting a bit of the old country. I’d locked the door, and then I saw, under the door came a sheet of paper, and someone on the other side went [clicking, shaking noise] and the key dropped out of the lock, onto the paper and went under the door and out and then somebody put the key in the lock and opened it! And there’s the grandmother without her teeth in like an old witch, all dressed in black saying, “Ah, bien alors, c’est une jeune femme, ah ah ah” [Ah, well, what do you know, it’s a young woman, ha! Ha! Ha!] You know, like that, and she was sort of checking up. And then she shut the door and buggered off. So if we talk about Gemma Bovery, a 100-episode serial for The Guardian is a bit more than 24 pages of a children’s book. It was. I don’t think I really knew what I was getting myself into. Tell me how you came up with what there was going to be. I had this idea when I saw somebody in Italy who looked rather like Madame Bovary. Originally, you’d shown me some sketches that she was going to look a lot more like Princess Diana. What was it that struck you about this woman you saw? So Flaubert’s Madame Bovary is something you’d read when you were quite young? 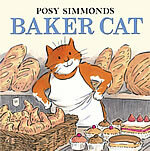 Yes, thanks to this French mistress, I read it about five times. Doing Bovery, I reread it and then I put it away in a drawer. What was your idea behind starting with a certain reassurance that at least you had a structure, even if you changed that structure, which you did? I had a great structure, the best: Flaubert’s structure. I felt it shouldn’t matter if the reader didn’t know Flaubert’s book, but if he or she did, they’d get just a little extra out of it. In this unusual format. You were describing the shape being very vertical. Almost your regular format turned on its side. Yes. A very odd format. I realized it gave me a lot of rows, which could be like paragraphs or even tiny chapters where you could change time and place. It had its advantages. In a way, I preferred it to the space I was given for Tamara Drewe. The other big difference for you is that it was intended to be run on a daily basis, Monday to Saturday. Wasn’t that right? That’s a big step too from doing a weekly. Did you want to have it daily? I think they wanted it daily because they had the space. They thought that people might forget what happened. So each page was written as a self-contained episode, which had to end with a cliffhanger of sorts so people would want to read the next day. In a way, how it evolved was very much to do with what they said or the logistics of the paper. The other big shift, apart from the shape of it, was the way you incorporated text and introduced typeset text. Which, I think, you’d never done before. Well your speech balloons are handwritten, aren’t they? You hadn’t come up with a font for your balloons. No. Not for them. That was hand-lettered. You feel quite strongly that balloons should stay hand-lettered? Some people are typesetting speech now. I feel happier. It’s part of the writing. It should be graphic. So, you made this transition which brings in Richard [Hollis, Posy’s partner] as your “team.” As your typesetter. Yes, a huge service. I would write the narrative in longhand, and he would set it. It’s a very nice, flexible shape in the end. It allows you to have large panels and shapes and clusters. It allows me to introduce things or have a larger picture or even have a tiny row underneath, which is kind of a footnote. Things normal fiction wouldn’t allow. Your theme is very much the wife that is longing for something more romantic. I made Gemma Bovery like Flaubert’s heroine, who read a lot of trashy novels and longed to have romantic affairs. And similarly, Gemma reads a lot of magazines. I made her the daughter of a dentist, thinking that in the waiting room all her life she would have been reading magazines - fashion, gossip, style - which would color her whole outlook… because magazines, they’re full of promises about a better life or improving your life in some way, so that would had been part of her outlook: that if you change your look, you change your life, and that went for her decor as well. She could change the way her room looked and believe her life would change, too. So, she gets fed up with London and thinks life in France would be paradise. There are plenty of magazines on this, and there is even a whole magazine called France just for Francophiles. Have you seen it? It’s incredible. It’s for those who love France. Can you imagine that the other way around? Well, the French can be Anglophile as much as we can be Francophile, actually. So they wouldn’t say your literature or your food, your beautiful Snowdonia. Actually somebody said Shakespeare. And somebody did say,“Your sense of humor.” And one person said, “Your language.” Which I think is one of our real treasures. Anyway, what were we talking about? Gemma’s character. Yes, Gemma’s dream. So, Gemma’s dream was to go to France and live this rustic, simple life with beautiful rustic furniture and somehow the very goodness of it would rub off on her and her life and she’d be fulfilled and she imagined having some beautiful child, running about in orchards and life would be lovely. And of course she gets as bored as anything because life isn’t like that and it rains, of course. Normandy, I think, is known as the piss-pot of France. It pisses with rain and, of course, she gets bored and then she has adventures. 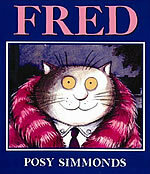 Particularly with a young aristocrat who is also fairly dim and shallow but also has his own romantic thing about him. It’s fascinating how the French and the English fashion an image of each other and romanticize and mythologize each other. Yes. I think, talking to young people, we’re getting more alike. It used to be the French were much more romantic, their ideas of love and doing things rather elegantly. Now lots of people just wear old T-shirts and smelly old campers. But you touch on Gemma’s sensitivity about how French women are able to look fabulous throughout their lives, it seems. Yes. They do. You see more better-dressed women, because it’s still important there. That could be a straitjacket of its own. In fact, these days I think fashions are gradually getting more homogenous. But, again, you still have the big transition from London to the country. Yes. I think that’s a recurring theme. You’ve got, very cleverly, in this book the different voices and the different ways of getting across those voices, not just in typeset prose. Or you have Gemma’s diaries, letters or handwritten things. You’ve used the graphic and typographic voices of the book. Yes. I realized, once I started doing it, that you have an extra voice. You could give the characters their voices in whatever way, whether it be in reported speech, in balloons or it could be diaries or their own voice-over, but then the actual drawings could be another voice as well. The drawing could also do things like films do where you could have things going on in the background. Counterpointing on what else goes on. Yes. I didn’t have enough room to put it in but I planned that if you went back through Gemma Bovery you could see that her husband Charlie actually had an affair with Martine, Madame Joubert, the narrator’s wife. Just maybe in the background or they would be talking where you’d see them. So you saw how Charlie got lonely and fed up when Gemma had her affair. Oh. That isn’t shown there, though, is it? Ah, I must look again. It’s quite hidden. It didn’t come out, because I didn’t have enough room. There are only a few instances where they’re together. I couldn’t find a way, but she admires Charlie because he does the cooking. You know in England husbands do the cooking. Yes, they might have, but I knew they expected 100 episodes and so did I. Yes. It was. I think most of them went off at a tangent. They were digressions from the main story and as I didn’t have enough episodes to resolve them, they got edited out. Right, right. It would have taken the story off into a direction that you didn’t think was so important. Yes. If it had been a written novel, obviously you could have done it. I suppose later you could have had a “director’s cut” to include them. I could have, but as I did it, when I was in the middle of Gemma, I had this accident. Yes, I heard you had a nasty fall. Was it before publication began? You were incapacitated for some time, weren’t you? How long were you away from the drawing board? It happened in October. It took that winter to be able to sit. I couldn’t sit, but I could draw standing up and I could walk, but I couldn’t bend. So it was just amazingly boring. Then it did get better. Were you still writing and sketching things? I was still developing, but I couldn’t actually draw it. But do you think, looking back now, that it was actually beneficial that you had that? Yes, I think to have time to do it…Yes. In fact it was wonderful. I think these things, especially serials, I mean I could have done with that with my new book b>Tamara Drewe. That was a matter of the timing being difficult. What did you change? What did you resolve as a result of that enforced break from Gemma? I think it clarified Joubert’s infatuation with Gemma. I knew exactly what he would see in the scenes where he watches her and Hervé. Also the shape of the romance between Hervé and Gemma, that they would begin by not wanting to know much about each other, but then of course they would find out more about each other. That can either put you off or actually make you more intrigued. I knew that she would be rather afraid of being dumped as she had been before by Patrick, and would want to hold back, until Hervé declared his love. She needed to be sure that she’s got a real romance, that somebody was actually in love with her and that it was the real thing. When Joubert hears this, it made him realize his own feelings, that he was in love with her and incredibly jealous. I realized that, having time to reflect. 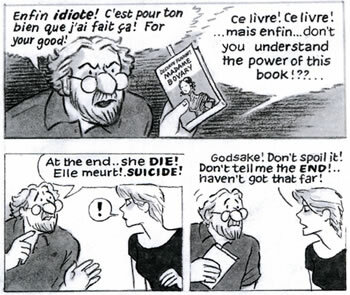 Graphic novels are very demanding, maybe more so than any other writing or fiction. And they’re particularly labor-intensive because you have to draw them. Yes, and if you don’t use whole pages, then you can’t reclaim that day or week that you spent on it; it’s gone. Part of what you play with in Gemma is the expectation the reader has of tragedy. Even a reader who doesn’t know the original Flaubert book intimately or have an idea of how tragic it is. Joubert, of course, explains and panics that Gemma’s going to come to the same fate. That gives it a subtext. The reader expects something to parallel. So you knew that something terrible has happened. Yes. And also if you knew Flaubert’s Bovary you might think perhaps arsenic. So I did play with it. Eventually, I did think life mirrored art rather too much. I remember being on the London tube a few times and at one point I remember reading it and someone said to me, “Oh, is that the new episode?” I mean people were quite caught up in it. Did you get feedback on this at all? Because I don’t think there’s been anything quite like it in British papers for a long time. To see it on a daily basis and have a serial that really did grip people. Yes. I think The Guardian were quite pleased. A strip of this sort is a wonderful loyalty builder. People can drop a paper from one day to the next, but if they know that they’re going to have a new episode they must find out what happens, which is exactly why the American newspaper strips worked. You wonder why there are not more, in fact. Yes, I’ve always wondered about that. I said, “You’re joking.” I mean, I’ve got an idea, but it’s going to take some work. I don’t think they realize that it’s like writing a film. I mean drawing a film. You’ve got to do location, props, costumes, dialogue, lighting, camera… you don’t get to sleep with the stars. 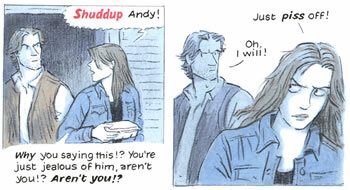 To read the rest of the interview, please see The Comics Journal #286.